Most of us 25+ years and older were very familiar with AIM. Unfortunately, as with all great things, it came to an end (or, at least very close to an end). The popularity of AIM saw a sudden decrease around 2009 after Gmail's Google Chat service released, along with text messaging and social networking sites. Still, I hung on to my AIM 5.9 account and let it idle 24/7 up until about 2015. In early 2016, I received a message, after logging on randomly, that my version of AIM would no longer work after March 15. So, in a bout of nostalgia-driven inspiration, I had the idea to recapture this time in my life by creating a similar app, AONOS. Go ahead and download it if you're on Android. If there's any demand, which, I'm sure there won't be, I can publish this on the App Store for iOS, given I built it using Ionic 2. First, this app is uhm, very lacking in features and is more for just the fun of it all. The idea came to me late Friday night, and I had it finished on Saturday evening. Suffice to say, virtually no testing has been done. Yes, this means there are no passwords or account systems. I wanted to build it out quickly. If there's a demand (again, unlikely), I can allow for custom email authentication and social logins. Right now, anyone can pick the same username. After choosing your username and logging in, you're sent to what appears to be a classic IM window. 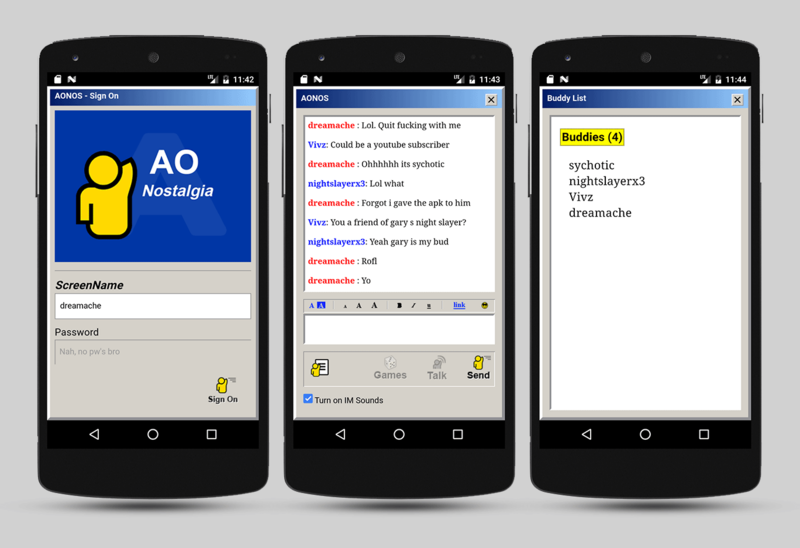 This is more like the oldschool AOL chat rooms, that allow multiple people to chat simultaneously. This really isn't a conventional buddy list that allows you to add and remove users, but rather a list of people who have logged in with the app recently. Admittedly, this what slapped together rather quickly and it is a bit buggy. Yeah, in order to capture the look and feel of the old client, I needed to include these in a visual sense. But there was no way I was spending more than 24 hours on this, so if you click on them, you'll get a little message informing you they do not work. I used Ionic 2, which is a hybrid mobile development framework built on top of Angular 2. It allows you to develop apps via HTML5, CSS/Sass and Angular, that can also hook into the phone's native functionality. I used Google's Firebase, via AngularFire2 to serve as the basis for the anonymous login system and the chat itself. In this article, I'm not going to get into the actual code, but if you're at all interesting in learning app development, I just released a Free Ionic Course for beginners that will get you up and running. Further more, a couple of weeks ago I wrote a tutorial on Building a chat app with Angular 2 that's very similar to AONOS. It uses AngularFire2 as well.